Thank you, Barb. Can always depend on you to keep us up to date with these. Thanks! I had to download two weeks to keep myself up to date! 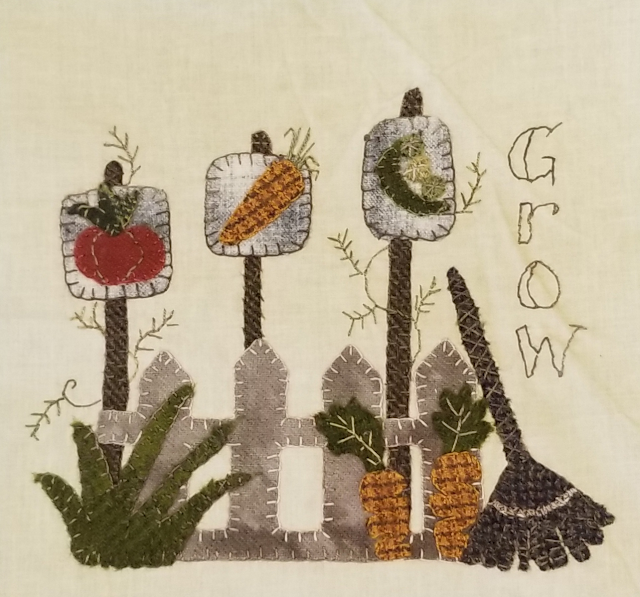 This weeks block is from Olde Green Cupboard Designs. Those of you still getting snow will be looking forward to gardening season. Link is here. Thanks Barb! I really like these blocks! How cute is that one?! Block 11 today from Simply Put Plus. You will need to download both files. Here is the page link. The free pattern link is right below the kit. hmm I will have to try later, not able to download it, maybe its an issue on my end. I don't use dropbox or google drive so can't help with either. I just clicked on the file and it downloads like any other internet file to my computer. I got it out of my google drive (collecting in a folder on my desktop). Our network was running slow this morning. Downloaded okay to my computer by right-clicking on image, choosing "download," and then directing to my quilt pattern file on my harddrive. Just got some new wool from Buttermilk Basin in the mail today, so am excited to start on these soon. Today is the last block from Bits and Pieces by Joan. You will need to download the pattern and instructions separately. Scroll to the bottom of this page to get the links. Next week should be the finishing instructions. Love the watering can, thanks Barb. So cute! Anxious to see how these all come together.